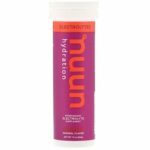 Nuun Hydration Electrolyte tablets just add electrolytes to your water without providing energy (carbs/calories). e-Fuel provides carbs to supplement your glycogen stores to allow you to perform at a higher level for a longer duration. Nuun also contains stevia which can have adverse side effects (see below), while e-Fuel is 100% natural with no artificial flavors, colors or sweeteners … it’s just clean energy! According to WebMD: Stevia (found in Nuun) and chemicals contained in stevia, including stevioside and rebaudioside A, can cause bloating or nausea. Other people have reported feelings of dizziness, muscle pain, and numbness. Using ingredients that cause stomach distress is the last thing that an athlete would want to deal with, so none of these ingredients are found in e-Fuel or e-Gel. Electrolytes are critical to maintain hydration and to avoid cramping and injuries.